In 2012 Stonehouse History Group began an exciting project to create a series of information boards around the town to tell people about the history behind the scenes we see today. 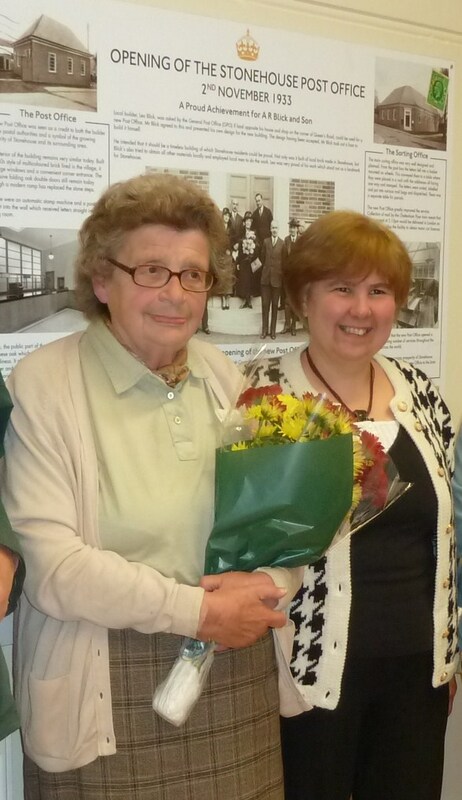 It started when committee member, Mrs Valerie Blick, offered to pay for an information board inside the Town Hall outlining the history of the opening of the Post Office. The building was erected in 1933 by the ancestors of Mrs Blick’s husband, Alan Blick. Stonehouse History Group members researched the history of the Post Office and Mrs Blick loaned the historic photographs of the original opening. Footprint Interpretation Design did the final design and creation of the board, which was unveiled on October 10th 2012. In 2015 we created our first four outdoor boards. We obtained grants from the MidCounties Co-op and Stonehouse Town Council to cover the costs of designing and making the boards. We decided where they should be located so that people could see them easily. Then we chose the right information and the best photos to fit on the boards. We sent our ideas for the first four boards to Steve Roberts at Footprint Interpretation Design Consultancy in Stroud and he designed them for us. We have three boards in the High Street by the Globe Inn, The Millennium Stone and the Woolpack Inn. There is also a board, sponsored by the Doverow Hill Trust, sited at the entrance to Doverow Wood. Thanks to the Town Council maintenance team for putting them up. in 2017 we created two more boards. One is on the fence by the car park at Stonehouse Park Infant School. The other is behind the low wall at Wycliffe College Chapel. Thanks to Wycliffe College and the Town Council for sponsorship. Also thanks to Stonehouse Park Infant School for fixing the Schools board and Barry and Ray, the Town Council maintenance men, for erecting the Wycliffe board. in 2019 two more boards were erected. 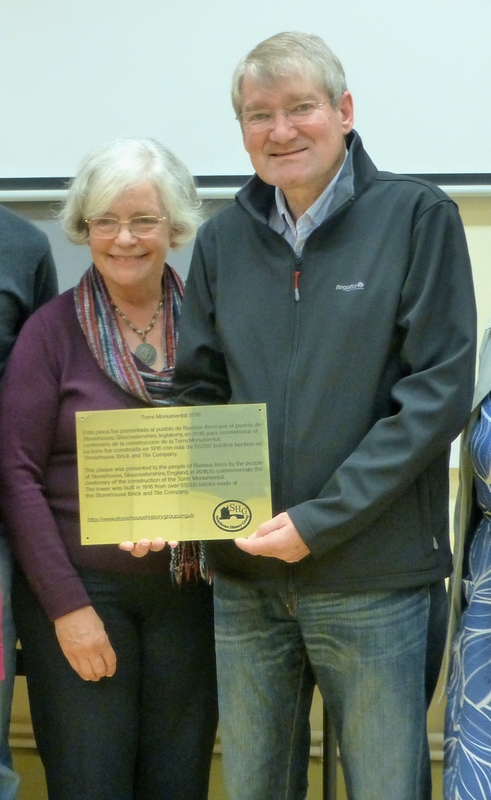 The Webb family sponsored the Railway board in memory of History Group member Darrell Webb, who died in 2017, and the Town Council, The Midcounties Co-operative and Stonehouse History Group sponsored the Laburnum Field board. 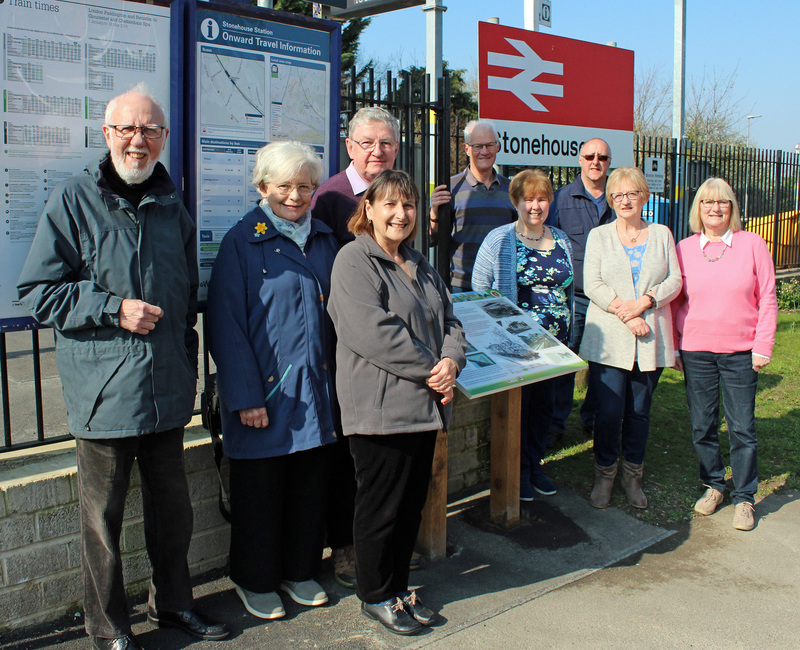 A new Heritage Information board was unveiled at Burdett Road Railway Station in Stonehouse on Friday March 29th 2019. This one is special as it was sponsored by the Webb family in memory of History Group committee member, Darrell Webb, who died in November 2017. Darrell was a great local history enthusiast who created and managed the SHG website for seven years. Darrell created the SHG Facebook page in 2015, which is now followed by 2776 people. Darrell also got involved in researching the history of Stonehouse contributing articles to the SHG annual Journal. The latest board is a fitting tribute to a man who did so much to raise awareness of the rich history of Stonehouse. It includes information about the Brick and Tile Company, which was sited next to the railway line, plus details about the history of the railway and roads nearby. Illustrations include a sketch by Darrell of the Victorian railway buildings which, sadly, were demolished in the 1970s. Another board has been erected in Laburnum Recreation Field which was originally donated to the parish by J.C.C. Kimmins as a First World War Peace Memorial. This board covers the history of the Field and the nearby Community Centre. We now have a total of 9 boards around the town and Wood. It is our intention to create a history trail around the boards with a leaflet to guide people. Darrell Webb with the plaque that he created to be put up in the English Tower at Buenos Aires, Argentina.